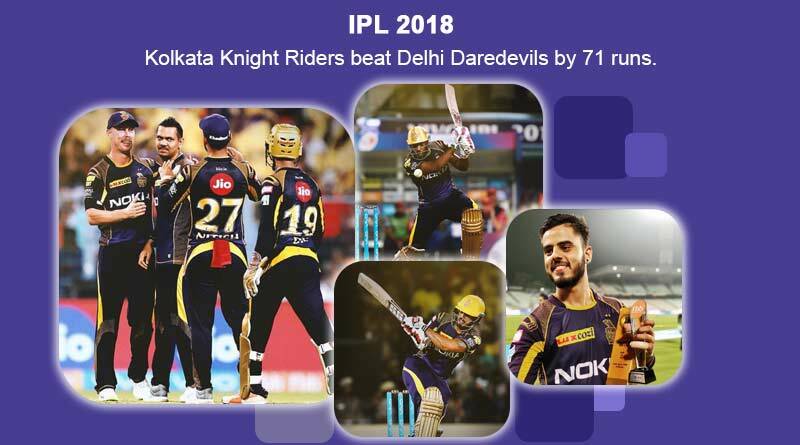 In the KKR Vs DD IPL 2018 match on 16th April, Kolkatta Knight Riders beat Delhi Daredevils by 71 runs. Gautam Gambhir’s return to his old side Kolkata Knightriders did not go according to the plan after his Delhi Daredevils side went down by 71 runs. A spineless effort by Delhi in the batting and bowling department saw them record their third defeat of the season. With just 1 win from 4 matches, the Delhi side sits on 2 points and are only above Mumbai Indians in the table who are yet to record a win. Things started off perfectly for Delhi on the night with them winning the toss and choosing to bowl on a pitch made in heaven for batsmen. And Delhi started for in just the right manner with Trent Boult bowling a peach of a first over to deliver the first maiden of this year’s IPL. He continued his fine spell as his second over to remove Sunil Narine for just 1. Unfortunately for him and the Delhi side he failed to get any assistance from his compatriots. Leaking runs left, right and centre, the Delhi bowlers came under heavy onslaught in match number 13 of this year’s IPL. The carnage started with Shahbaz Nadeem getting trashed for 15 in his first over. Surprisingly he was given all his 4 overs despite bowling pathetically and went onto concede 43 from his 4 to turn the tide in Kolkata’s favour. The dismal run for Shami continued to add to Delhi’s vows as Gambhir’sstrategy to keep bowl him after the first 10 overs failed as the Indian pacer was smashed for a half-century off his full quota of overs. Gambhir’s tactics were surprisingly questionable as he failed to rotate his bowlers properly and bowl them at the right times. This paired with Andre Russell’s and Nitish Rana’s blizzard innings saw Kolkata register a strong 200 off their 20 overs. Coming out to chase with their task cut out for them, Delhi had the worst possible start after last match’s winner Jason Roy was dismissed for just a run. Delhi went on to lose captain Gambhir instead 4 overs to find themselves at 24-3 and well off the required run rate. A mini partnership between Glen Maxwell (47) and Rishabh Pant saw a mini-recovery from Delhi before they went onto collapse again and be dismissed for just 129. After KKR Vs DD IPL 2018 match, all eyes are now set to the match between MI vs RCB to be held today at Wankhede stadium in Mumbai.